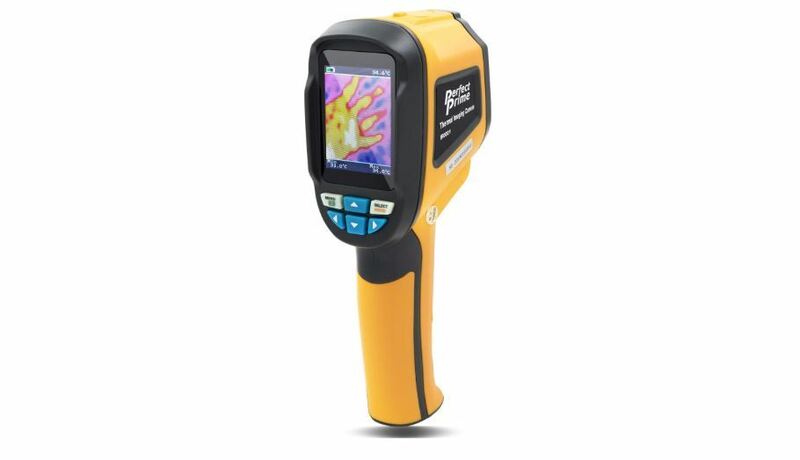 If you are looking for a budget handheld thermal camera, we highly recommend the Perfect Prime IR0001. It’s designed mostly for non-professional use at home for things like checking insulation, engine repair, HVAC maintenance and general home inspection. But you can also use it for basic professional applications. Because of the camera’s limited resolution, you’ll get the best results when you use it for close-up inspections. 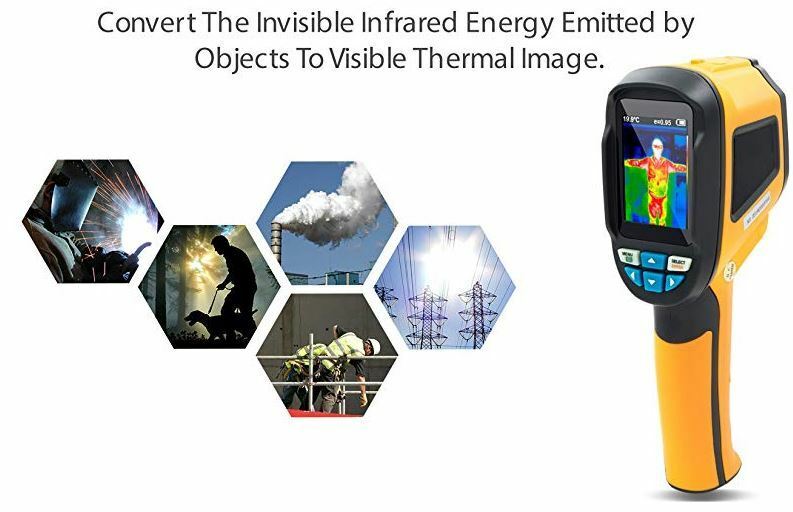 It comes with dual cameras – an IR camera and a visual camera – which means it has an image overlay feature that adds more detail to your thermal images. The temperature range is wide enough for most home applications (and even some commercial ones). 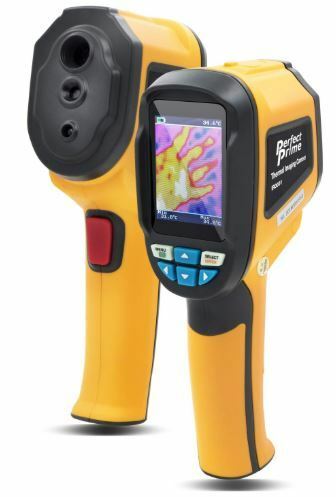 Keep reading for our full review of the Perfect Prime IR0001 handheld thermal camera. If you are looking for something different, maybe a higher resolution camera or a smartphone thermal camera, check our reviews of the best thermal cameras for sale. When you first switch on the camera, the resolution might seem lower than you expected. While it’s true that the camera’s 32 x 32 resolution is on the lower end, it’s good enough for short-range applications. As long as the object is not too far away (ideally between 1.6-6 feet), the sensor picks out details of the scene with good accuracy. With a thermal sensitivity of 0.15°C,the sensor can detect the slightest color differences, allowing you to inspect an area in more detail. The IR camera can read temperatures as cold as -4°F and as hot as 572°F. The wide temperature range makes the Perfect Prime IR0001 ideal for inspecting things like car engines, wiring, HVAC systems, insulation, walls and roofing. The IR0001 has two cameras: an IR camera that takes thermal images and a normal camera that takes visual images. Unlike other dual camera models that have different modes for thermal-only, visual-only and mixed images, the IR0001 has a more intuitive way of adjusting the type of image displayed on the screen. You use the arrow buttons to select how much of the visual details are added to the thermal image. At 100%, you get a full thermal image with no visual details. At 75% you can see a rough visual outline of objects. Reduce the percentage further add more visual detail. At 0%, only the visual image is displayed. This allows you to select the kind of image you want on the fly without having to go into the settings menu. The IR0001 weighs only 320g and comes in a compact handheld design. It’s easy on your arm and you can easily use it in tight spaces. It’s also great for on the go use. It will fit into just about any travel case. The camera is built to withstand a bit of rough handling. So don’t worry about a few hits and bumps. The camera sensors and display are well protected. The camera stores images in an SD card that is included with your purchase. It can store up to 25,000 images. To transfer the images, remove the SD card and insert it into your computer or an SD reader. Here are some of the settings you can adjust using the physical button located right below the 2.4” display. Color palette: Options include gray scale (good for getting more detail from images), high-contrast (ideal when you want to see the highest and lowest temperatures), iron and spectra. Emissivity: This improves temperature readings on different types of surfaces. Device settings: These include time and temperature units. If you are hoping to use the camera for hunting or security, it won’t be very helpful. Beyond 16ft, the images lose detail. It’s designed only for close-up inspections. Note: The Perfect Prime IR0001, like any other thermal camera, cannot see through walls or glass. This is not the best choice if you want highly detailed thermal images. Even with the visual overlay feature, we’d still not recommend the camera for certain sensitive commercial applications. Get a higher-resolution thermal camera instead. The Perfect Prime IR0001 is perfect for most close-range inspections of HVAC systems, home insulation, electrical wiring and other systems. It is light on your hand, provides excellent detail at the right distance and lets you configure multiple settings for different situations. It’s a great choice for anyone looking for a budget and portable thermal camera.